•Restrictions on native clergy: Until 1588, natives were barred from being ordained or joining a monastic order. This led to great racial inequality within the church hierarchy. Throughout the 1700s, church officials usually assigned top posts to Spanish-born whites. Secondary positions went to Creoles [whites born in the New World]. Mestizo [mixed European and Indian ancestry] priests usually received difficult parishes. At the bottom of the racial ladder stood Indian priests; though Indians made up more than 44 percent of the population, they were appointed to low prestige parishes. As a result, by the early 1800s, most priests were foreigners. •Loss of evangelistic zeal: Reports of missionary work in the early 1500s, described thousands of baptisms and great fervor among the friars. During the late 1500s, in the wake of the Protestant Reformation, Rome moved to centralize the church’s political organization. As this occurred, many evangelizing efforts seemed to lose their zeal. As one missionary complained in 1562, “The old fervor and enthusiasm for the salvation of souls seems to have disappeared.” Many of the secular clergy who arrived during this period preferred to preach only to Spaniards. They despised the Indians and were unwilling to endure the hardship of ministering to them. •Quarrels among the clergy: Infighting had a negative impact on the conversion of the natives. For many years orders such as the Franciscans, Dominicans, and Augustinians had been the only representatives of the church in the New World. They squabbled among themselves. But they mastered native languages and established good rapport with many indigenous communities. Naturally, they carried out parish work. But by the middle of the sixteenth century, members of the secular clergy—who, according to canonical law, were supposed to administer parishes—increasingly sought to assert this authority. Power struggles multiplied. 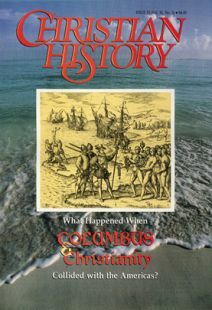 •Hostile or indifferent settlers: Although friars earnestly sought to school Indian children, Spanish encomenderos [masters] often were unwilling to allow the Indians time away from their work to learn. To make the Indians afraid of Christian teaching, Spaniards in New Spain (Mexico) twice burned the church and monastery at Valladolid. How should the church evangelize the Americas? Two strong leaders faced off over the question.